Summer is usually a term quite unstable for the markets. August is a month with higher volatility as capital flows diminish and movements show bigger than they really are. This summer, markets experienced a sudden fear not related to economic or financial reasons, but political ones: the Ukraine crisis. Investors were always with an eye on this country, which is living a civil war. Behind of this war, there is a hidden power fight between Western countries and Russia, as a new edition of the old Cold War. When such kind of political tension exists, money flees. The war still exists and is far to be solved, but it seems that the market worries changed in the last weeks to other motivations: Central Banks. The World Central Banks meeting in Jackson Hole, US, some days ago, showed the different strategies that are being discussed by the monetary policy managers in their influence areas. Analysts and investors are almost sure that a rate hike will be sooner than later in the main world economy, but Mrs. Yellen is still reluctant while unemployment does not strengthen its downwards slope. In Europe, on the contrary, markets are very sensible to every word that Mr. Draghi says, because it is to expect that new expansive monetary decisions will be taken. For today’s ECB meeting, analysts opt for some explanations instead of new decisions, as more details about TLTRO (a system to lend huge money amounts to banks). ECB Chairman announced in Jackson Hole that the institution is ready to act. Meanwhile, main European countries inflation and GDP figures were quite bad. This is considered as a pressure for the ECB to decide new measures. LatAm countries are under the shadow of two crises: the eternal Argentinian debt troubles and the recession in Brazil. In the case of Brazil, analysts comment that this decrease in the GDP has to do with the post Football Worldcup effect. In any case, low prices are still attractive for investors in this area. In Asia, worries increase around China, as the recovery momentum slowed and opened doubts about the strength of the upward movement. 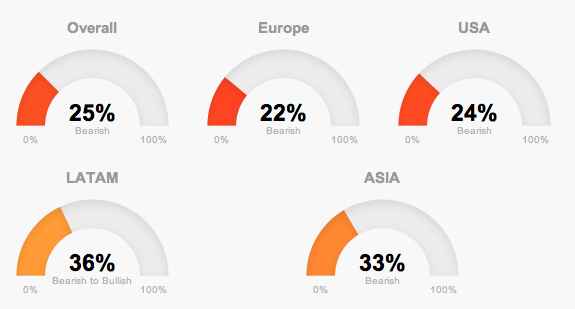 However, T-Advisor global trend tool shows that the second world economy markets are sounder that some months ago, when the trend was deeply bearish. This entry was posted in Our Charts and tagged China, ECB, Jackson Hole, Ukraine, Yellen on September 4, 2014 by Oscar Garcia.